An online fax service can send a fax with Gmail by forwarding the email to the fax service. Most fax services will turn the subject line and body of the email into the cover page of the fax, and the attached files will be sent in the fax transmission. Most fax services can fax through Gmail as an email. To send a fax, an email is composed with the main body of the email becoming the cover page, and the attached file converted over to the main part of the fax. When receiving, the fax arrives directly to Gmail as a received email with the received fax attached as a PDF. For full details on online fax services compatible with Gmail and other email accounts, see our page on Online Faxing. A connected fax machine will not directly work with Gmail. It only provides a similar interface to Gmail. Using a connected fax machine, you can “print” a fax in very much the same way you would send an email. Some connected fax machines can print directly to a fax number. 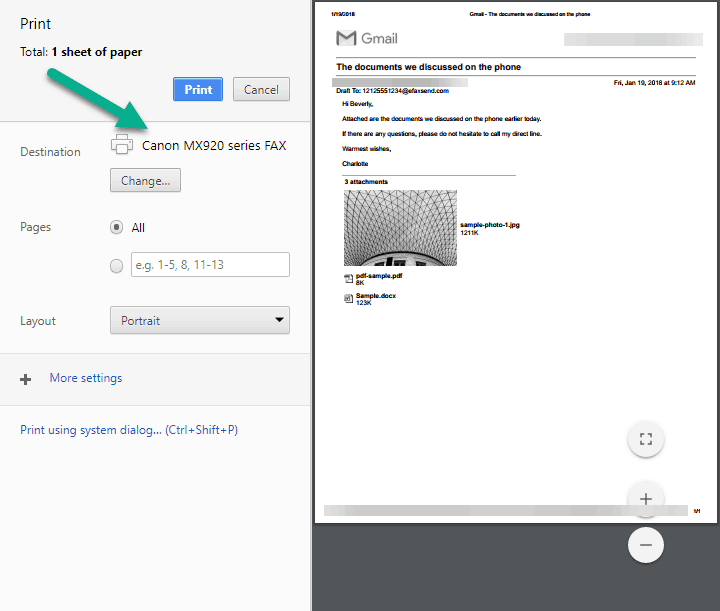 Select the “Print” option in an email and choose the print driver for the connected fax. Follow the menu prompts to send the fax. Fax software turns your computer into a replacement for a fax machine. While there is no direct integration with Gmail, it will be able to send many of the same documents Gmail can send. With a Windows computer, faxing is done by opening the program, composing a fax, attaching the Office document, and sending it (it works very much like an email program). While Windows Fax and Scan does not automatically update contacts from Gmail, they can be imported. With a Linux computers, faxing is done very much the same way as Windows computers. However, Gmail is not directly compatible with the platform. The online fax service RingCentral offers a plugin that adds a menu directly into Gmail. The plugin integrates with the contact list in Gmail. Most (but not all) fax services have some sort of smartphone app for faxing. These apps do not integrate with Gmail, rather, they replicate the “email experience” with a parallel system for faxing. There are no other adapters that are compatible with Gmail. Some fax machines can act as a relay to forward a fax directly to a Gmail address. Can I send a fax from my Gmail account? Yes, you can fax from a Gmail account using an online fax service or by printing from a fax machine. Can I receive a fax to my Gmail account? 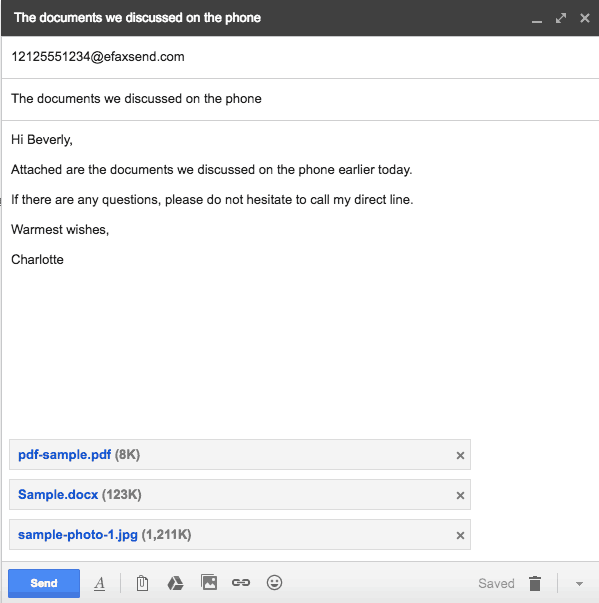 Yes, you can receive a fax to a Gmail account using an online fax service or having a connected fax machine enabled with a fax-to-email feature (this feature is typically found on corporate-level devices). Can I connect my Gmail account to a fax machine? Not directly. You can, however, print from Gmail to a connected fax machine/printer. You can also set up some fax machines to forward a fax to email (this feature is typically found on corporate-level devices). Can my fax machine forward my faxes to my Gmail account? Are there any online fax services compatible with Gmail? Most online fax services are compatible with any email address, including Gmail email address. Is it easier to fax with Gmail as opposed to a different email system? Can I fax documents such as Adobe PDF or Microsoft Word through Gmail? Fax Authority – How to Fax from Google, including Gmail, Google Voice, Google Drive, and Google Docs – our pages with instructions on how to send or receive a fax with various Google products and services. Each page includes a step-by-step walkthrough of different methods to fax. Google Support – Print Gmail Messages from computer, iPhone & iPad, and Android – Google’s support articles on how to print a fax from Gmail. Many connected fax machines are capable of sending a fax using the print driver. Houston Chronicle Small Business – How to fax to a Gmail account – A quick article on how to fax to a Gmail account. It is essentially a summary of how to sign up for an online fax service. AZ Central Your Business – How to send a fax with Gmail – Some quick walkthroughs for various fax services. They are summaries of how to send faxes using online fax services eFax, Faxage, and MyFax.